What were the leaders of the free world really doing during all those meetings? As the creators of Cabinet magazine and historian David Greenberg reveal here, they were doodling. Our Founding Fathers doodled, and so did Andrew Jackson. Benjamin Harrison accomplished almost nothing during his time in the White House, but he left behind some impressive doodles. During the twentieth century–as the federal bureaucracy grew and meetings got longer–the presidential doodle came into its own. Theodore Roosevelt doodled animals and children. Dwight Eisenhower doodled weapons and self-portraits. FDR doodled gunboats, and JFK doodled sailboats. Ronald Reagan doodled cowboys and football players and lots of hearts for Nancy. The nation went wild for Herbert Hoover’s doodles: A line of children’s clothing was patterned on his geometric designs.Featured in The New York Times Book Review, CNN’S Situation Room, CBS Sunday Morning with Charles Osgood, and All Things Considered. The creators of Cabinet magazine have spent years scouring archives and libraries across America. They have unearthed hundreds of presidential doodles, and here they present the finest examples of the genre. David Greenberg sets these images in context and explains what they reveal about the inner lives of our commanders in chief. Are Kennedy’s dominoes merely squiggles, or do they reflect deeper anxieties about the Cold War? Why did LBJ and his cabinet spend so much time doodling caricatures of one another? 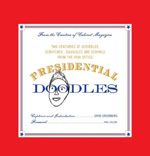 Presidential Doodles offers a glimpse into our presidents’ most unguarded moments. On “The Charlie Rose Show,” November 20, 2006.